A tall glass of smoothie seems so inviting especially during this summer time. While some of us trying to limit hot coffee I personally can't do that. Good thing, this coffee shop offers two of my comfort food (coffee and ice cream) in one exciting drink, Affogato. 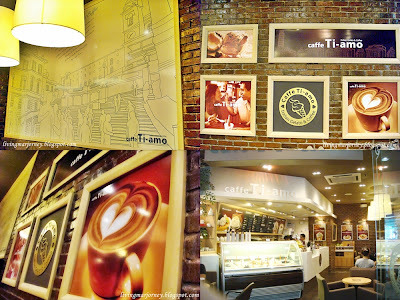 Caffe Ti-Amo, a South Korean Franchise brought to the Philippines by Jollibee Food Corporation. This coffee shop offers Gelato in wide variety of flavors like Tiramisu, Vanilla, Coffee, Dark Chocolate, Green tea, Yogurt, Mango, Caramel, Blueberry, Strawberry, Choco Mint and Dulche de leche. Gelato, Italy's version of ice cream. But gelato is smoother in texture and more creamier, it has lower fat content than regular ice cream. Tiramisu Caffelato Frappe - coffee based frappe blended with Tiramisu Gelato topped with Whipped Cream and Chocolate syrup. It brings a burst of flavorful pleasure to the palate especially this summer time. Nice drink to cool down. Tiramisu Gelato on blended coffee matched together, creating the right sweetness. I had the tallest size (Grande) at p135, I also enjoyed scooping the remaining whipped cream. Caffe Ti-Amo's bestseller, AFFOGATO - hot espresso topped with vanilla or tiramisu gelato. The gelato has cashew nuts on top with the espresso poured slowly over the gelato right in front of you. I wasn't able to take a photo of espresso, the server needs to poured it immediately to prevent from what he called "espresso bad shot". Drink it before the gelato melts down. Now, this is an Ice Cream Float! Isn't it? At first I thought I wouldn't like it but I love the taste! It's worth trying! You may scoop it or drink it what ever you like. Nice look, Gelato drowned in hot espresso! It's deliciously different having the comfort of ice cream and the richness of espresso. Caffe Ti-Amo has a nice interior as well; modern style brick-walled, chairs and tables arranged so that customers seat comfortably and enjoy their stay. They offer Coffee-free and Coffee-based Frappe, Italian Gelato and Gelato Specials, Hot Chocolates and Tea Blends, Coffee and Espresso. Cheesecake and Waffle are also available. Relax and enjoy Caffelato with a friend or loved one or simply bring back the memories of your childhood with a scoop of Gelato.